Our 2019 Programme is below but it may change as we are asked to perform at other events during the year. Keep checking back for the current situation! Here you can see, at a glance, what we were doing month by month. There are links to the various pubs and venues; maps for the various locations, and Post Codes, too, to help with using your Sat Nav to find us; links to the various festivals we attend most years, and links to other dance teams that we meet up with during the year. A copy of our 2019 Programme can be downloaded and printed here, but please note all details are provisional unless otherwise stated, and are subject to change. Everyone is welcome to come and watch us, unless otherwise stated. Whilst every effort will be made to appear at the declared times, it may be necessary to cancel for some reason. However, we will always turn up at the advertised venues and, if unable to dance outside due to the weather, we will dance inside, if enough space is available and if Landlords are happy for us to do so. We will also entertain the patrons with our music and songs. Our practice sessions are on Wednesday evenings from 7.30pm until 9.30pm until the end of April 2019. Our new venue for regular workshops is The School of Creative Arts, 22 Millbay Road, Millbay, Plymouth, PL1 3EG. We would welcome any prospective new members - dancers or musicians. No experience needed. We look forward to seeing you! 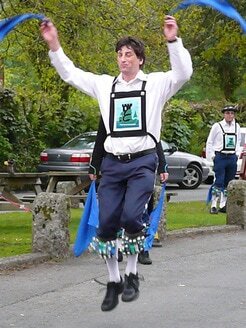 King John Morris Men Day of Dance. The Hoe Promenade, above Smeaton's Tower, Plymouth Hoe. Dancing at sunrise, hopefully in the presence of the Lord Mayor or Deputy Lord Mayor of Plymouth.